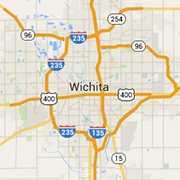 Wichita is home to some of America's best attractions and entertainment. For an evening out, a fun-filled weekend or a summer vacation, your plans start here. Browse Wichita museums, parks, zoos, performing arts centers, theatres and more. Nestled in the heart of Wichita sits one of Kansas' best kept secrets--Botanica, a botanical garden and regional horticultural center. A Wichita Museum showcasing the heritage of the American Indians in North America. Distinct Examples Of Historically Important Wichita Architechture From Frank Lloyd Wright to Carthalite and Important Bridges. As the largest art museum in the state of Kansas, WAM is home to a nationally renowned permanent collection of nearly 7,000 works of art. Over 80 park and recreation areas offering everything from beautiful settings for picnic lunches to pony rides.